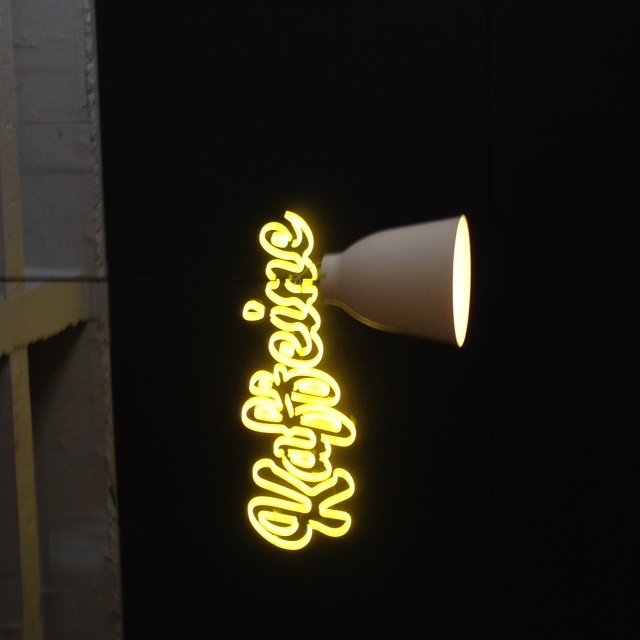 It’s nearly 7 years since Kaffeine first opened its doors on Great Titchfield St, but Kaffeine on Eastcastle Street is a new addition having opened just over a year ago. 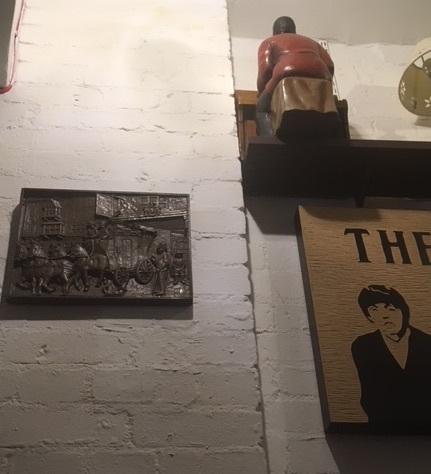 We visited the younger Kaffeine a couple of weekends ago when looking for a coffee in the Oxford St area. Along with an iced coffee, an Americano and a long black, we had a raspberry/cashew slice and a slice of banana bread. 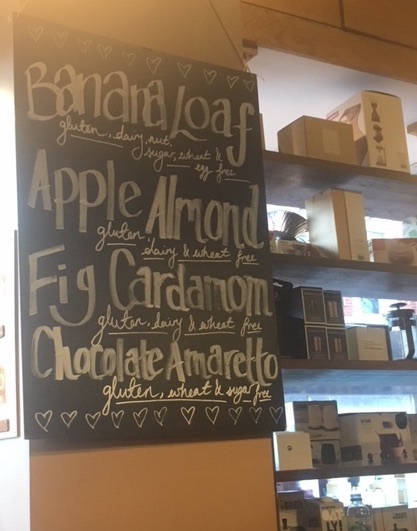 It was a relief to find that Kaffeine had a good nut policy so I could confidently enjoy my banana bread, knowing it was nut-free, while a friend devoured the cashew containing slice. The staff were attentive and friendly and there was plenty of space inside to sit and chat while taking in the surroundings. In this regard, it was nice to see this same point being made on Kaffeine’s own website where it says that you can “…sit at the high stools at the massive sun filled front windows and watch the world go by”. With the accompanying coffee, what more could you want? 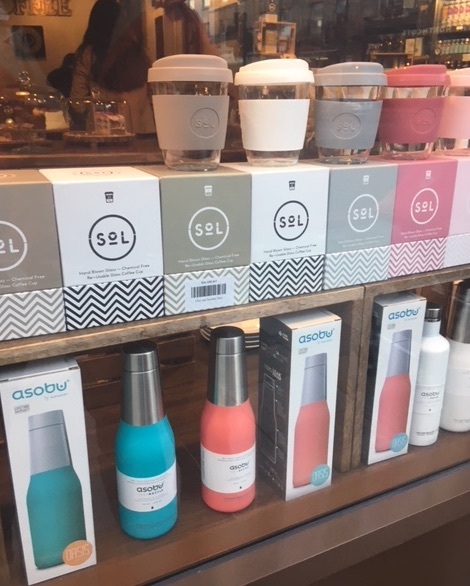 The coffee was, of course, very good (beans from Square Mile), and it was great to see that part of the philosophy behind Kaffeine is to take “the art and science and practice of making espresso coffee to a whole new level”. It’s always a pleasure to see those three distinct, but essential, elements combined. I do however remain unconvinced that many could tell the difference (in a blind taste test) between an Americano and a long black. The table top at Kaffeine, Eastcastle St.
Complimentary mint-infused water was on offer at the back of the cafe and, although this made the Daily Grind last week, there was just too much to notice at Kaffeine to make this the subject of the cafe-physics review. Indeed, from the perspective of anyone who wants to slow down and notice things in a café, Kaffeine is brilliant. This cafe-physics review could have been about so many different things. There were the weights holding the door open in a pulley system. The trademark neon sign. The compact-ness of the cashew/raspberry slice or the reflectivity of the copper on the side of the counter. I was in cafe-physics review heaven! So many different mental alleyways to run down and explore as the different bits of physics came into view. From pulleys to Archimedes, cakes to ceramics science, copper to atoms or to the odd puzzle about the colour of gold, all these will have to wait for another time. This time, what struck me was not what could be seen but what could be felt. Far from going into a subjective piece about the ambience of the cafe, I mean this statement far more literally. The table, with the wooden grain, felt rough. 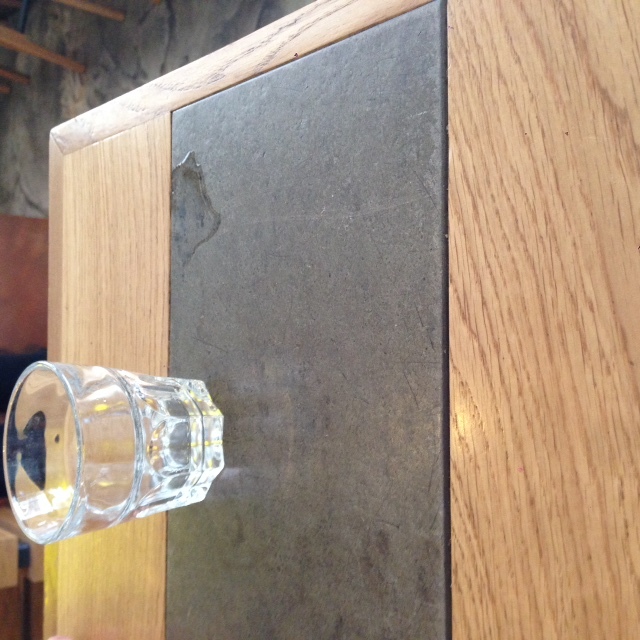 In the middle of the table, a piece of slate had a surface that was more smooth and then, on the walls behind us, highly glazed tiles were very smooth indeed. What do we mean by rough or smooth, how rough is rough, how smooth is smooth and what has it to do with the “magic mirrors” of Japan? The wooden bit of the table for instance has a surface that undulates with a height of the order of about a millimetre. The slate is far smoother but the surface would still be rough, probably on a length scale tens to hundred microns or so (about the size of espresso to medium grind coffee). 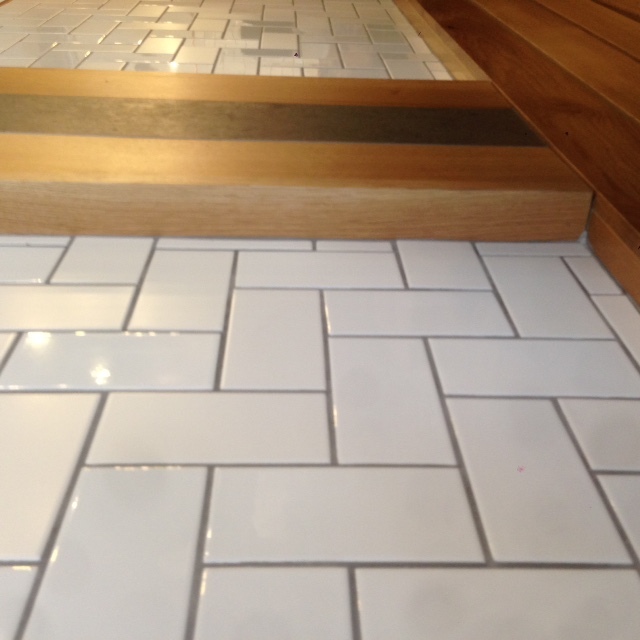 The tiles are a lot smoother than both the wood or the slate but they are still not so smooth that they could be considered flat on an atomic scale. To be flat on an atomic scale, the surface would have to have a height variation 100 000 times smaller than the smallest particles in an espresso grind*. While some crystals can, naturally, have ‘faces’ that are this smooth, the semiconductor industry needs to be able to achieve this level of flatness routinely to provide the electronics for your smart phones, computers and even perhaps the electronic scales that are used to help you make your coffee. 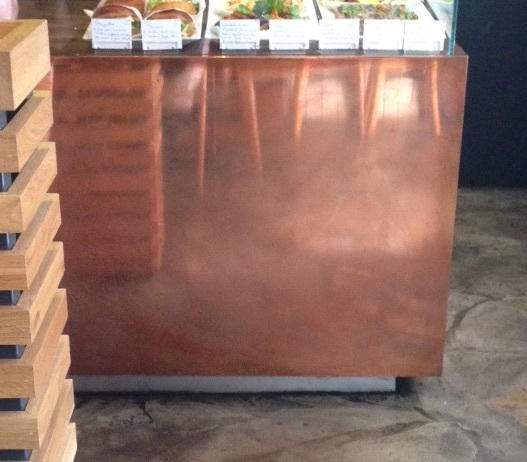 The mirror-like copper clad counter. In ordinary life however, perhaps we think that a smooth surface is like that of a mirror. So it is worth taking a look at an odd type of mirror for which very small variations on the surface cause a very strange effect: the “Magic mirrors” of the far East. Typically made of bronze, these mirrors have been manufactured for nearly 2000 years. On the back surface of the mirror is an artwork (perhaps signs of the zodiac or other religious symbols) which is in relief. The front of the mirror meanwhile is highly polished but slightly convex. Looking directly at the front surface of the mirror, there is no visible sign of the image on the back. Maybe you don’t find this surprising, the mirror is solid bronze after all and we can’t see through solid metal. However, if you were to take a step back, shine light on the front of the mirror and look at the reflection of the mirror projected onto the wall, the image at the back can clearly be seen, there in the reflection (you can see photos of this effect here). Initially this phenomenon was dismissed as ‘trickery’ but subsequent, careful, study showed that small deviations from perfect curvature on the reflecting surface were enough to cause the effect. Although the mirrors were cast and then polished, nonetheless, stresses and strains from the pattern on the back had propagated through the atomic structure that forms the metal and resulted in tiny, invisible to the eye, changes on the front surface of the mirror. Sometimes it does appear that looking at things in a different light can really change our impression of what something is. * Scaling to coffee grind size approximate but based on measurement of grind size reported here.